It is possible to migrate or transfer your Outlook Email Account settings direct from the Registry and copy them to a new PC. It’s usually a good idea to back up the existing registry key on the new PC before deleting it. Remember to always make a registry backup first. Open Outlook at least ONCE, and DO NOT create an e-mail account a this time. Just follow the start up screens until it is done. Find out the location of your PST file (go to TOOLS -> ACCOUNT SETTINGS –> DATA FILES). Take a note of the PST file location or use Where’s My PST?. Close Outlook (don’t minimize, CLOSE IT). Open Outlook again. It may give you an error message. Just ignore it and close the message window. Outlook will open with all your e-mails and accounts already restored. Your email passwords will need to be manually inserted. Import the RULES back (TOOLS -> RULES AND ALERTS -> OPTIONS -> IMPORT RULES). Note that you may have to “adjust” some rules in very rare cases. In most cases you just need to re-enable them. As your PST file uses “direct access” to link some “shortcuts”, the Address Book link will probably be lost (but all the addresses you have are still there). To fix it just delete the EMPTY address book on the tree and link yours using the address book tool to fix the shortcuts (TOOLS -> ADDRESS BOOK). In Office 2007 the Registry Key also carries the RULES, so then you don’t need to export them. 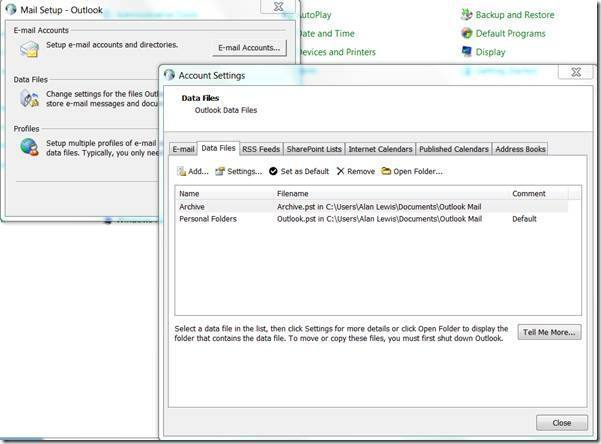 With previous version of Outlook the rules require the exporting method. You can also manually recover the Outlook Email Account settings.